Over the course of this semester, I have been utilizing the program Sherpa, written in Python, to model Potassium (K) absorption lines and make three specific measurements. Specifically, these measurements are the equivalent width, full width half maximum, and line-to-continuum flux ratio. In this entry, I will show the commands I utilized to make these measurements. If you followed my post on modeling with Sherpa, then I have used 3 separate model components to create my model. These include the power law (pl), the lorentzian (l1) and the gaussian (g1). The power law describes the continuum, and the three together represent the data. The output will be the equivalent width value, in microns. Nice and simple. The hard part was constructing the models and eyeballing the lower/upper limits for the eq. width measurement. All of this I did manually by eye. 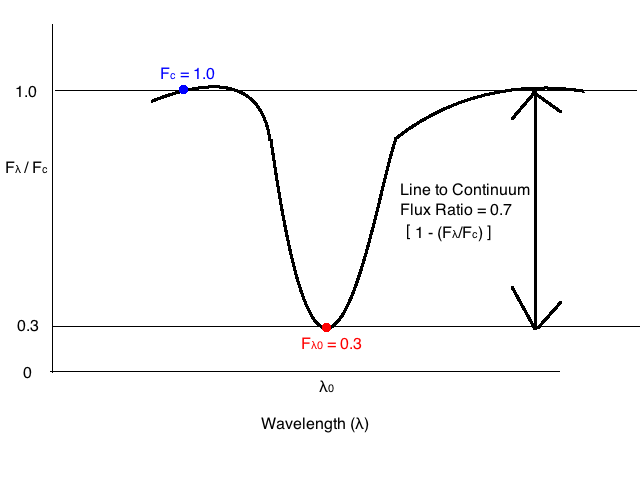 >>> depth = 1.0 - (F_model/F_cont) # The line-to-continuum flux ratio! The problem with this algorithm is that sometimes there are pockets of spectrum that are equal to or lower than the half max, which get into the wls array. For those, I had to go through them manually and fix the wls array. This week I've started looking into making measurements of spectral features using Sherpa (program in Python). Before doing this, I wanted to understand what these measurements are, visually. These three measurements are Equivalent Width, Full Width Half Maximum (FWHM), and Line-to-Continuum Flux Ratio. Shown in the figure above is the equivalent width (W) of an absorption line. The idea is you take the total area inside the absorption line, and create a rectangular box of the same area, extending from the continuum to the 0 flux line. The width of this box is the equivalent width. This measurement is used to describe the strength of the line (the higher the value, the stronger the line)! Shown in the above plot is the Full Width Half Maximum (FWHM) of an emission line (it's the same idea for absorption lines). You get the peak (maximum) value of the emission line, and draw a line at the half point. 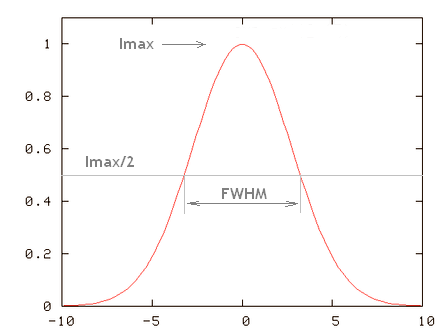 The width of the spectral feature at this flux value is the FWHM. For an absorption line, it's the half of the minimum value instead of maximum. This measurement is used to describe how broadened the spectral feature is (the higher the value, the more broadened the line)! As illustrated above, these measurements describe a spectral feature. To recap, the equivalent width characterizes the overall strength of the line, the FWHM characterizes the width, or how broadened the line is, and the line-to-continuum flux ratio characterizes the depth of the line! Together, you can discern what the spectral feature may be saying about the physics of the scenario or target you are observing.